2 The Benefits of Kingston Brass? Why Kingston Brass? Kingston Brass is one of the most recognizable brands in the market of faucets and there is a good reason behind this. Not only are most of their faucets well below the $150USD mark, but they also come with excellent reliability, incredible practicality and some of the easiest installation currently found on the market thanks to detailed, yet legible instruction manuals. Each and every one has excellent reach, to aid you in your kitchen preparation and cleaning and looks solid and well crafted, to ensure you get gallon after gallon of excellent water. 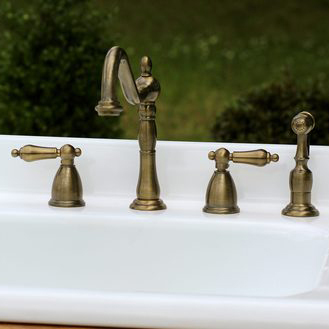 Listed below are the Kingston brass faucet reviews, to help you on your way when picking from their extensive product line! With its classic arched appearance and smooth, chrome based appearance the Kingston Brass KS8711DLLS has a timeless look that mixes incredibly well with its modern materials and solid construction. With a 13 ½ inch spout clearance and good water pressure thanks to its 2.2gpm water flow, the performance matches the looks incredibly well and this thus means that throughout testing, we were able to fill numerous pots and pans with incredible ease. Whilst a sprayer function would have been somewhat more preferable for the cleaning abilities, the pure force of water behind the stream setting means that you will be able to remove tough dirt and grime with ease. 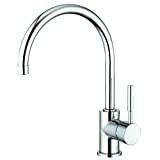 The extension of the spout is some 8.5 inches and this also allows for good use throughout your sink area which is never a bad thing. 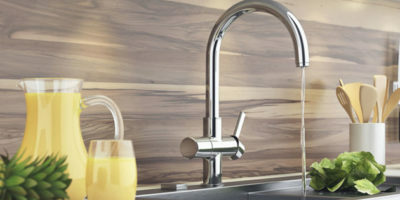 The standard installations come with both 1 and 3 hole installation and this means that the weighting of the faucet also looks fantastic by and large. 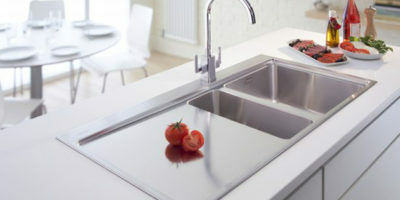 There is even a ceramic disk installed which means that the faucet will not drip whilst you have it installed. With its smooth operating valve and a good price of around the $100USD mark, this is one of Kingston’s simplest yet most desirable faucets and it comes heavily recommended to those looking for a practical, attractive faucet. Reliability is also great, even a year after installation. 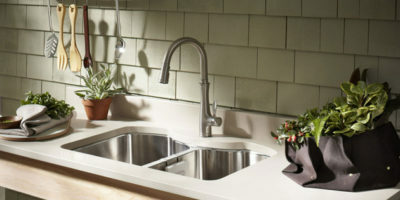 This is a particular faucet offered by Kingston that really does go for simplicity and style to match. 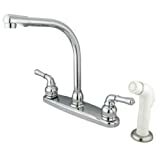 The look, with the two handles either side of the faucet head, gives it a classic kitchen tap look, and if you have a kitchen that is going for a somewhat more traditional look, this faucet will fit right in. With the faucet arch some 8 inches high, you are also given good clearance over the sink and throughout testing, we did not run into any issues regarding the filling of various containers thanks to the faucets overall size. Reach was also good, allowing you to maneuver the faucet all over the sink with minimal effort. This reduces the need for you to reach over, placing extra strain upon yourself that is frankly not needed. The price will also make you smile. Coming in below $60USD, this is a faucet that just about anyone can afford and its practicality does not end here. For one, it comes with an incredibly simple 4 hole installation set-up, which allows the faucet to be at the center of your sink area. The water flow rate is also excellent, at some 2.2gpm and this generates good pressure and thus cleaning and filling abilities, as the flow rate is high. This is an incredibly reliable and generally desirable faucet offered by Kingston, and if you are in the market for a cheap and practical faucet, this is an ideal solution for you! 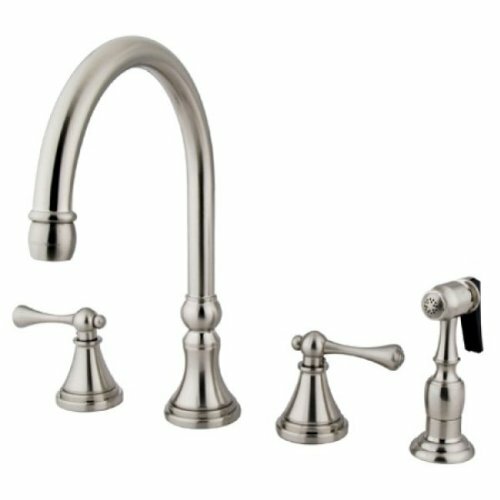 Yet another faucet set in the center of your current sink installation, this particular unit does things a little differently than others offered by Kingston. With its smooth, rounded design and excellent weighting, this will bring a real sense of style and sensibility to your kitchen for a fraction of the price you would usually expect. It is incredibly practical too, with a 16-inch reach and an 8-inch height meaning it will not get in the way of your kitchen duties! The base unit is also bronze, which gives it a solid and robust feel and it also has excellent reliability to boot, according to Amazon testimonials. The flow rate is also fantastic, at some 2.2gpm which means the pressure is never an issue and this also allows for incredibly easy filling of pots, pans and also good washing abilities. The handles are wide placed for good weighting and the handles also turn forwards for extra fine tuning of the temperature and water flow. There is also an installed ceramic valve that ensures the unit remains drip free, and the 4 hole installation is also incredibly simple, meaning you don’t even have to be a professional plumber in order to fit the unit. Pricing is towards the higher end of the spectrum, at well over $200 but it is worth it for the overall weighting and general functionality of the faucet. This is a unit that is well worth the money if you can afford it. 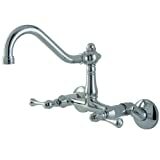 Wall mounted kitchen faucets are somewhat rarer than other types of their inherent installation is a little trickier than those found in the sink itself. That being said, they look excellent from a visual standpoint and this particular unit from Kingston is no different. Having excellent weighting, with the handles some 3.5 inches apart and a spout that can reach 8.5 inches meaning that filling pots and pans is incredibly easy, this is an incredibly practical faucet that gives you, even more, the room below it than some of the larger faucets offered from Kingston. 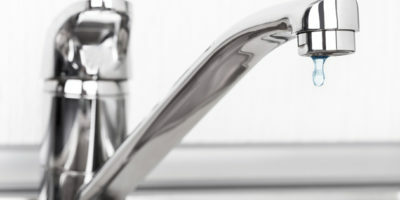 To install, you need to fix the faucet up to two holes and some additional drilling will be required, but once fitted this will be the last of your headaches as reliability is noted as being superb. The handle is of a Buckinghamshire Design that fits the overall aesthetics incredibly well, and the head also spins some 360° for even more functionality, which is never a bad thing. If you are looking for an excellent wall mounted faucet, this is probably one of the best you can find and comes highly recommended. The price comes in at just over $110USD, but it is well worth it. The Benefits of Kingston Brass? Kingston is one of the most reliable names in the business, with their excellent construction and design that means their faucets rarely leak and users also report excellent customer service, no matter the product you have an issue with. The base materials for all of their faucets are brass, which also reduces the general wear and tear you may suffer from their regular use. 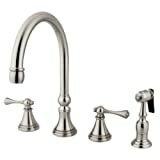 Kingston faucets also look excellent, no matter the price range attached to them. They have a superb range of both contemporary and classic designs, available in numerous colors and finishes and each and every one has fantastic weighting throughout, meaning that they do not look overstated or out of place in a variety of kitchen settings. The Kingston warranty for their products is also one of the most robust that you will find. 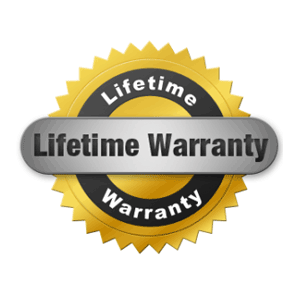 No matter the age of the faucet, or unit at hand, most of them come with a reliable ten-year guarantee or, at the very least a lifetime warranty relating to the finish and general internal workings of the faucet. 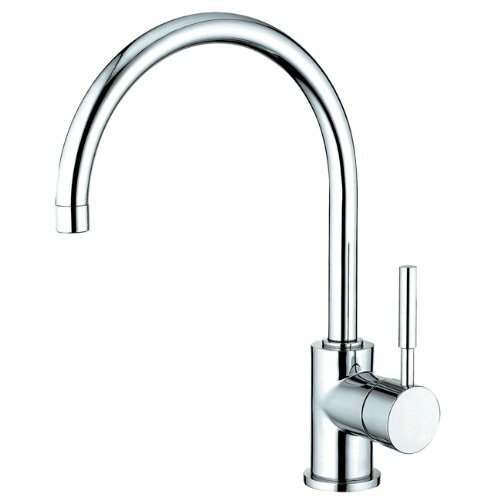 The aeration abilities throughout the Kingston range are noted as being some of the best in the faucet market and the pressures that they generate are also more than satisfactory for cleaning and general filling of your numerous kitchen containers. The abilities of the brand far surpass the cheap prices when compared to other brands. Kingston brass faucets are some of the best and most recognized currently available on the market, giving you superb performance and great aesthetics each and every time you enter your kitchen. Utilize these Kingston brass faucet reviews throughout your buying process, and when you are in the market for a particular faucet, feel free to consult Amazon and your local providers to check what you are buying will be right for you and your kitchen. Thanks for reading!